After experiencing my first gong bath, about 14 years ago, I just knew that it was my destiny to work with the gong. I was experiencing a group gong bath, many of us had little or no knowledge of the sounds the gongs would produce. After the first sounds, I settled down and felt my body deeply relax onto the mat. The next thing was the sound of silence at the end of the journey. Fifty minutes had elapsed in what seemed like a moment and my thoughts dwelled on the image of a mandala that had formed above me. 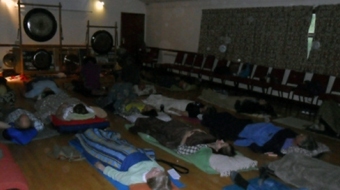 Within the silence at the end of the gong bath, there was a profound stillness which stayed with me for a long time.